Two years ago, I was struck by this blog post about online responses to one of Lady Gaga’s online posts. In it, Lady Gaga had talked about appreciating a homily about the Eucharist when she was at Mass. I keep remembering this post in part thanks to the Facebook memory feature, since I had shared it back then, but also because the term “Jansenism” has become relevant again in modern Catholic culture. This is in part because we have a Jesuit pope and people are using the Jesuit-Jansenist conflicts of the seventeenth century to interpret Pope Francis. In fact, this recent article about Ross Douthat connects his views also with that old conflict, almost as an aside. Sr. Theresa’s blog post—aptly titled “Lady Gaga and the Online Eucharist Police”—focuses on the uncharitable responses to Lady Gaga that assumed that “1) Lady Gaga received Communion, 2) she did not go to Confession first, and 3) she was not in a state of grace. That’s a lot of assumptions to make about anyone, but particularly someone wholly unknown to us personally.” She argues that it is possible to correct people in a way that is more in line with Christian charity. But, if you look back into the history of Christianity, that is not true. For example, I think of the early correspondence between Saint Augustine and Saint Jerome that I read for a paper I wrote for one of my M.A. seminars. This correspondence could be categorized—using Pope Francis’s words—as verbal violence. Antoine Arnauld had a similar tendency in his polemics with the Jesuits during the Jansenist controversy. In the midst of the part of the controversy that would result in his expulsion from the Sorbonne, Mother Angélique advised her brother, “I beg you very humbly that, for the edification of your neighbor, you speak always with as much modesty and humility and that your natural haste might not make you betray your heart that I know to be consistently humble, gentle, and charitable, by the mercy of God.” The emphasis here is my own. Her advice to Antoine reveals what she knows of his natural tendency—like Saint Jerome’s—to reply quickly in such a way that might come across as uncharitable. But what interests me in all this is the way that the internet has allowed us to get so involved in other people’s business and to judge what they do, which is exactly the tendency that Sr. Theresa critiques in her blog post about the response to Lady Gaga. In my previous post about modern-day Jansenism I said I was reluctant to identify any Jansenists, though “I strongly suspect that Jansenist tendencies exist in the modern-day Catholic Church, both in terms of moral and sacramental rigorism and their views on grace and salvation.” Now, I must note that commentary on public events was part of the Jansenist controversy in seventeenth-century France. For example, the part of the controversy that led to Antoine’s expulsion from the Sorbonne began over a conflict between the Duke of Liancourt and his parish, Saint Sulpice in Paris. The Duke had enrolled his daughter at the convent school at Port-Royal and in January 1655, because of this connection with the Jansenists, the parish vicar refused him absolution and communion. The Duke eventually reconciled with his parish, but Antoine wrote and published (publicly!) two texts about the controversy. It was his second text that was examined by the Sorbonne, leading to his expulsion. Now, coming back to today, there are two things that stand out to me in the public comments about Lady Gaga in Sr. Theresa’s blog post: first is the focus on rules and the law—so, moral rigorism—and second is the tendency to want to exclude people from the sacraments—implying a quasi-Jansenist view of grace that is closed off, not welcoming. So, as I said in my previous post, online comments such as these are part of the reason I suspect Jansenist tendencies exist in the church today, the tendencies that show a desire for a church that is purer and more rule-based than is found in Pope Francis’s calls for more pastoral care and a more welcoming way of dialogue. The issue of judgment sticks in my mind as well. I recently got involved into a little tiff on Twitter over history and tradition and theological development. 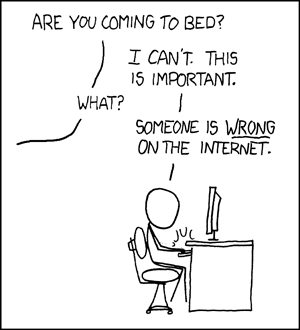 I opted to remove myself from that conversation rather than get stuck in the “someone is wrong on the internet” spiral. But in this, what kept coming to mind was Pope Francis’s often quoted (devoid of context) “who am I to judge?” (In the case of the Twitter dispute this was over judging what is true and false development.) The question applies also here—who are we to judge other people, like Lady Gaga, especially when we don’t know their individual situations. However, I am reluctant to use this to apply to strangers on the internet, or even public figures that I don’t know personally. The context of this comment is a discussion about the head of the household being responsible for his children and slaves so Augustine, even though this quote seems general, is talking about a context in which you have a close relationship with the one in sin. The issue here is how much we know about a given situation. In his most recent apostolic exhortation, Pope Francis categorizes all this under the heresy of Gnosticism. That is, the idea that we have the right to judge others needs to be—at the very least—tempered with a good dose of humility. He writes, “It is not easy to grasp the truth that we have received from the Lord. And it is even more difficult to express it. So we cannot claim that our way of understanding this truth authorizes us to exercise a strict supervision over others’ lives” (G&E 43). It seems to me that Pope Francis is right to recognize the continued resurgence of ancient heresies in the Catholic Church, I just see a different heresy than he does. Letter DCCXCII to M. Arnauld, 22 December 1655.